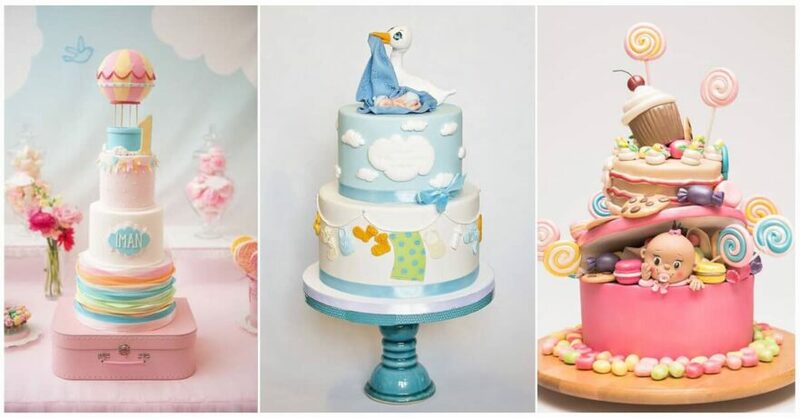 Okay, if you stumbled upon on this article I am sure you need a baby shower idea, so start looking at these wonderful baby shower cake designs! The cake will set the tone for all the other decisions and it offers deliciousness of course, but it’s a decorating element too that adorns the food table. The mom, or guest of honor, expects a cake that’s personalized according to what she likes and anything known about the baby. 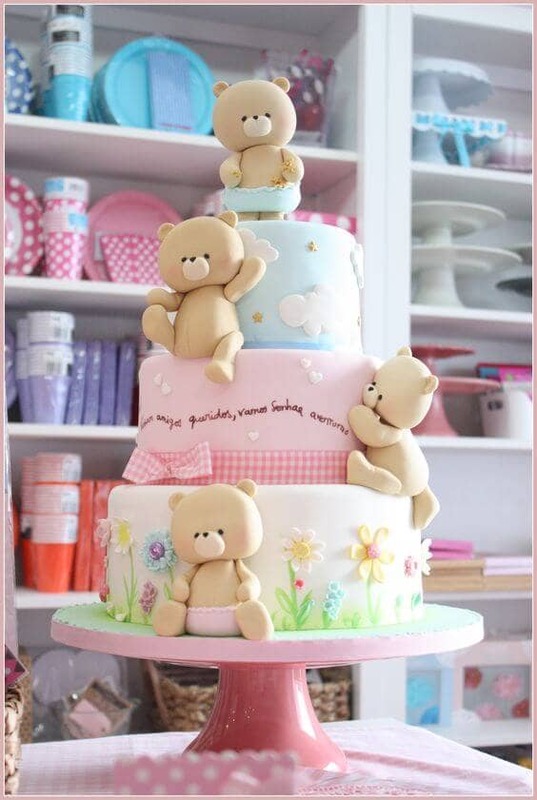 So to satisfy her we deliver the coolest baby shower cake pictures that will inspire you. Cakes are the centerpiece at parties for special occasions like birthdays, anniversaries, or weddings. 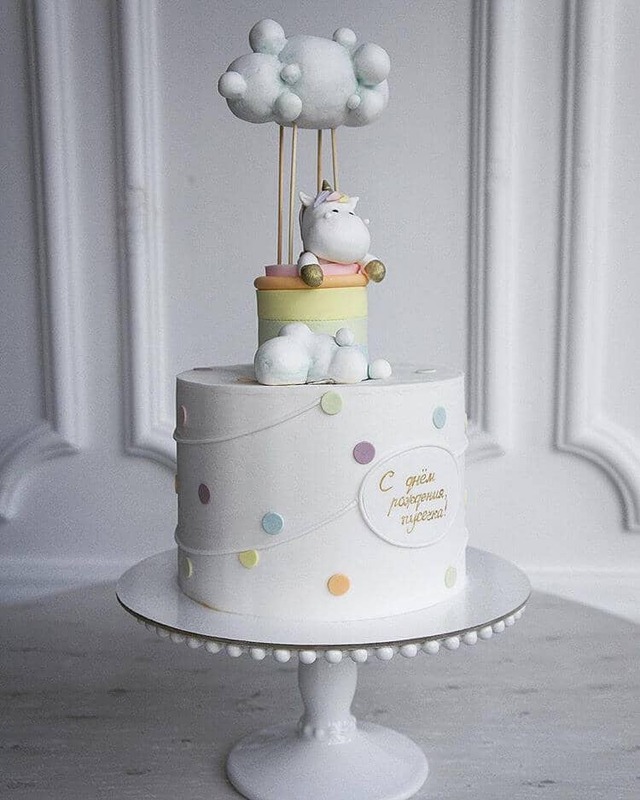 At a baby shower party, the cake should reflect the parents’ style, the colors in the other decorations, the gender of the baby if known, or the date of the baby’s birth. The “pink for girls” and “blue for boys” is traditional. The cake should be the right size for the number of guests. You’ll see from these 50 pictures that many are cute, sophisticated or funny and usually have a theme. A message can also be written on the cake. Most have a “topper” or main design focus on the top. 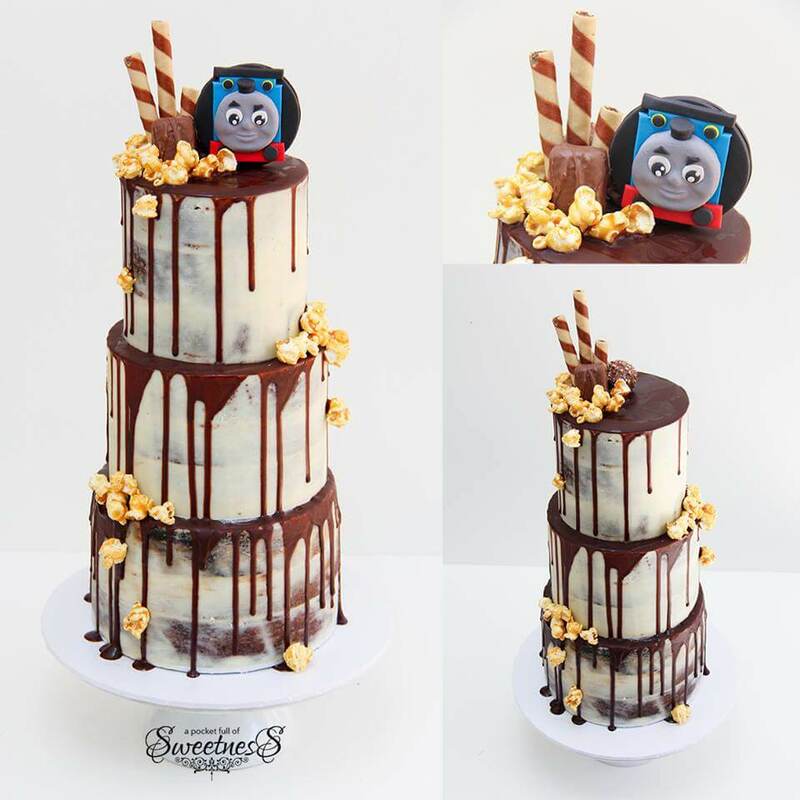 Popular trends are elephants, woodland scenes, hot air balloons, monkeys and realistic detail are seen in cakes seen on the internet and in bakery advertising. Toys, storks and teddy bears are still pretty common too. Many of the cake ideas are tall with multiple tiers which makes a visual statement. Cake design is an art that has gotten more impressive with new icings and techniques being used. Take a look at our gallery and find the best ideas for 2018! Soft earthy colors dominate this two-tiered, woodsy-themed cake. 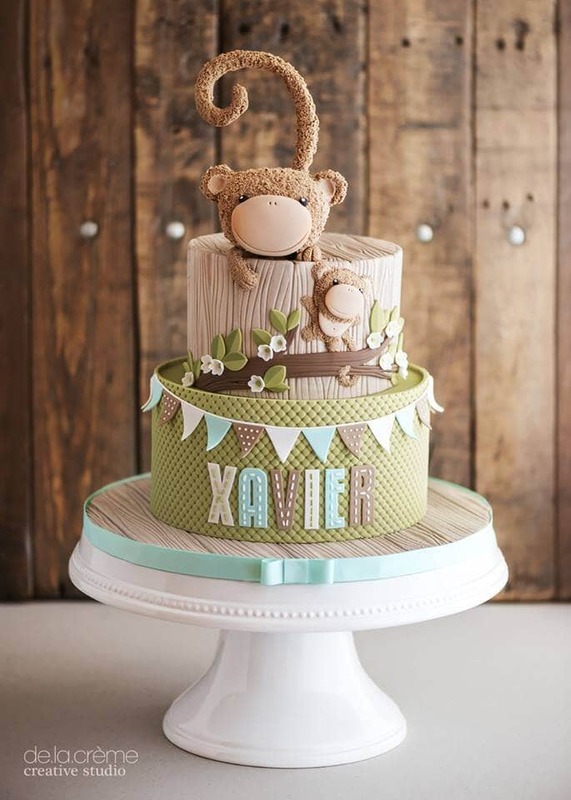 This is one of the baby shower sheet cakes that feature a smiley, plush little monkey. A monkey baby shower sheet cake topper is a super popular choice in 2018. There’s also a perfect place for the baby boy’s (or girl’s) name under a banner and a pretty ribbon encircling the wood-grained base. This one is really tall making it look great on the food table. Thomas has been a popular character for many years from the TV show. He’s on this with straws for drinking in the cake’s chocolate deliciousness. Caramel corn is scattered around this baby shower cake for boys. Thomas stands out nicely because of his blue and red accents. 3) Just As Sweet as Can Be! This baby shower cake is so sophisticated! It’s one of the smaller ones but still probably three layers. It’s a tie between the white elephant and the gorgeous flowers for the prettiest element here. And there’s a perfect little heart-shaped balloon he’s holding with his trunk? There is a great spot for the baby’s name too. This one is gorgeous! Stark white fondant sets this cake apart and also provides a clever place for your message. The pretty polka dots and striped pastels are a lovely contrast against the white for showcasing the friendly hippopotamus. 5) Look What the Stork Brought! 6) This Stork Is a Pro! 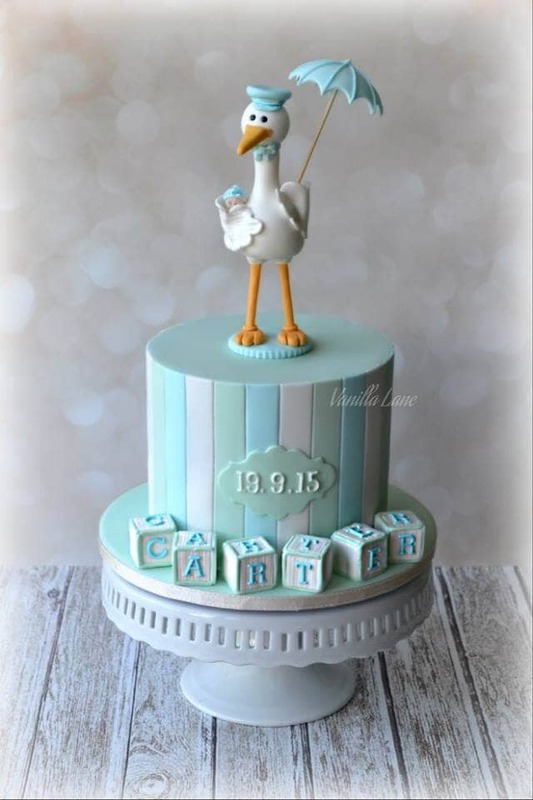 The stork on this cake not only has a hat and umbrella but is holding the baby securely under its wing! If that isn’t enough, he’s also standing on a cake that has the baby’s name in blocks and date of birth written on it. This is an awesome teal and aqua creation. Well, that’s a mouthful! 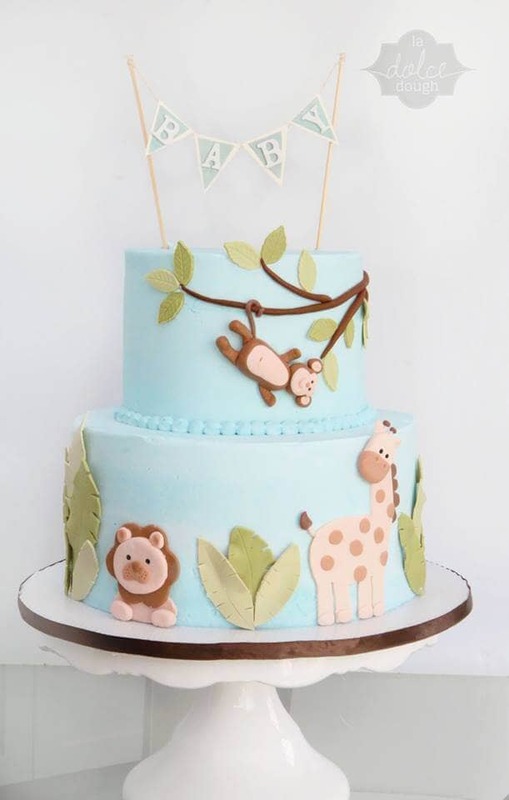 But a mouth full of this fondant covered aqua beauty is what’s in store for the guests when they taste this beautiful baby shower cake that features sweet and friendly jungle animals. It’s perfect. Here’s one of the smaller baby shower cakes that is still 2-tiered. 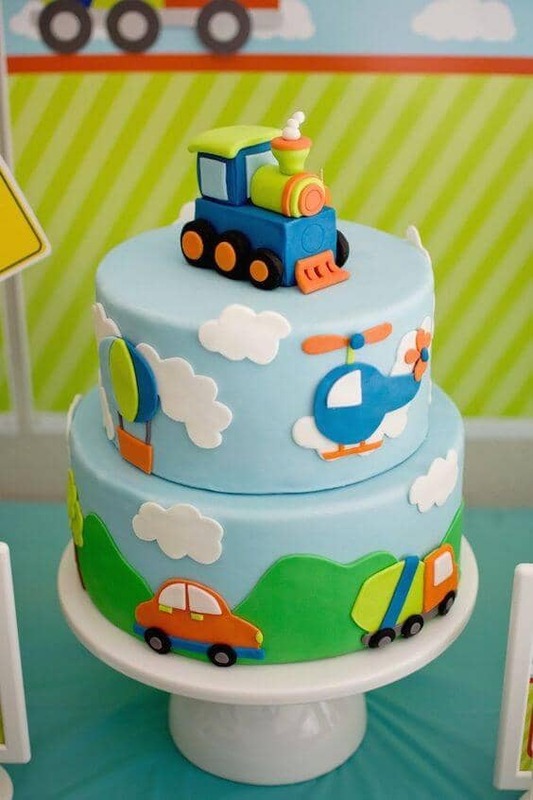 Shown on the cake are all the kinds of things boys love that move, a car, a truck, a helicopter, a hot air balloon and a train engine topper. All pictured against a smooth sky blue background with clouds. Lovely. 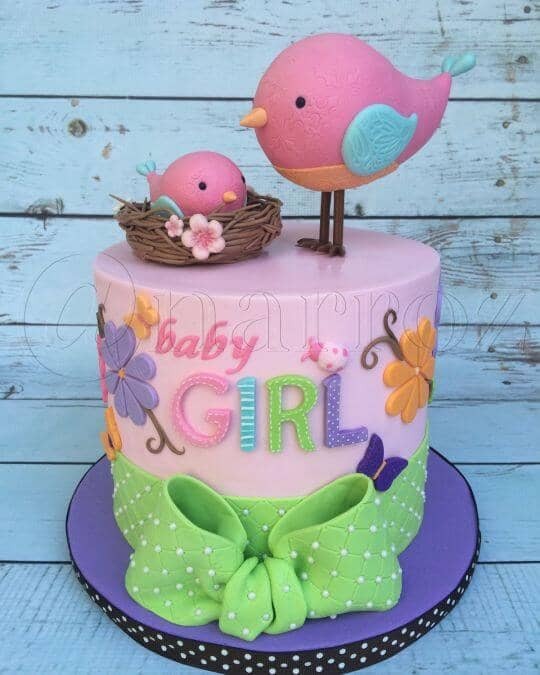 The colors on this 2-tiered baby shower cake are as soft as can be. 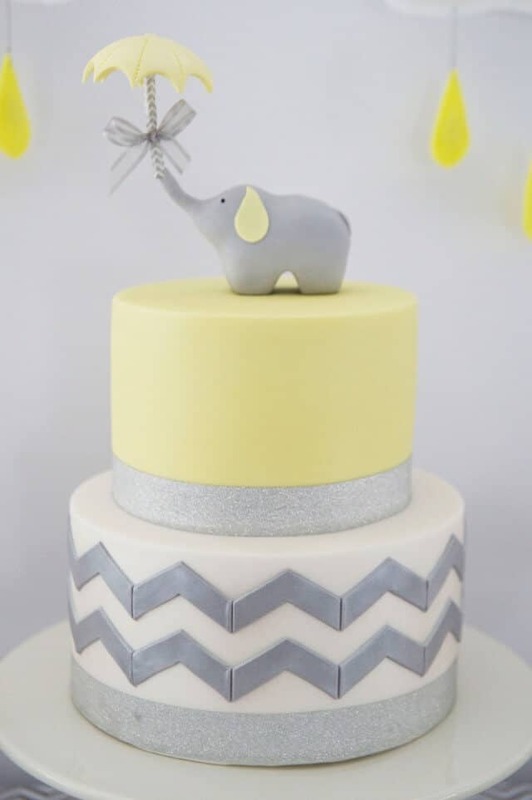 The sweetest elephant ever is the cake topper, sitting in a puddle next to a curious little bird. The other animals surround them on the bottom layer. There’s also an elegant ribbon around the middle with a place for a custom monogram. Yellow stars are tumbling onto the bottom tiers while the baby sleeps by a crescent moon. The baby is guarded by a little pink rabbit and a sturdy elephant. 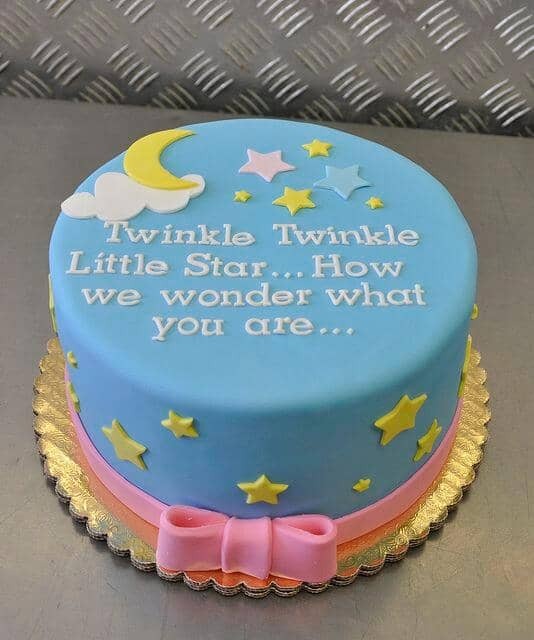 The words “twinkle, twinkle LITTLE STAR” are the message on this creamy frosted cake idea. This cake is very nicely-designed! 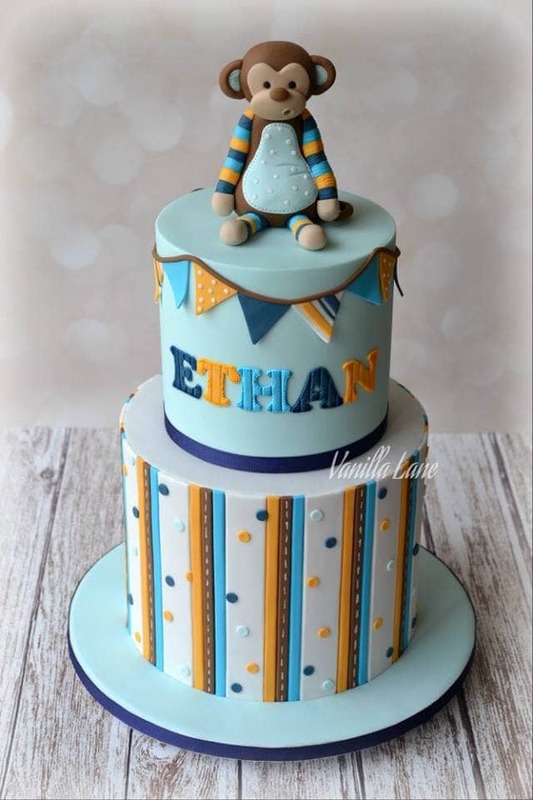 It’s clearly a baby boy cake with its repeated blue, orange and brown striping, the cute little animal topper and the pennant border above the baby’s name on the upper tier. It’s also tall to give it a good presence on your baby shower table and has a sleek and modern but very cheerful look to it. This is a fun cake for boys! This one is so colorful and striking! The patterns are mixed on the bows but the word “baby” in bright green dominates beneath a large bow topper. The three smaller bows adorn the bottom tier. Everything is in the same cool color palette. This baby shower cake idea sits on a slice of wood for a platter and is elevated atop a wooden box. The cute fawn matches the colors of the wood and peeks from behind one of one of the big full pink roses. 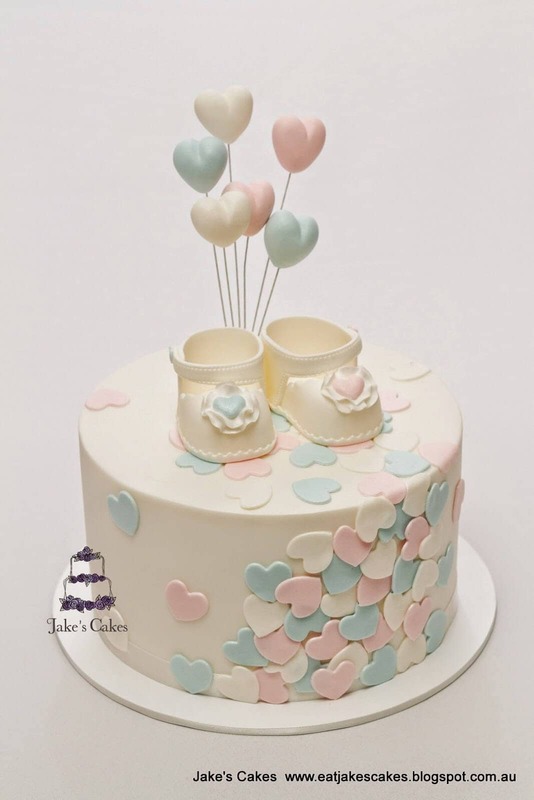 This is one of the baby shower cakes shown that is frosted with classic white buttercream. Delicious. This might be the best one yet! In the year 2018 creativity has no limits. This topsy-turvy, dreamy 2-tiered wonder takes your breath away. 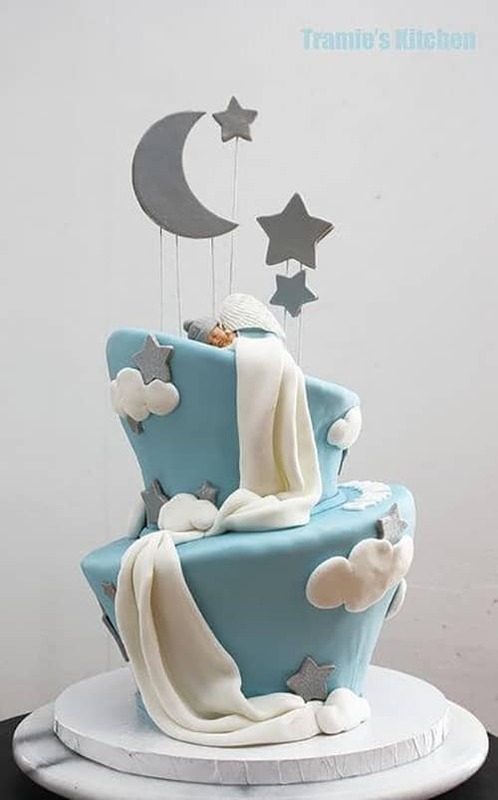 A realistic-looking baby tops this cake with an impossibly long blanket draped across both tiers. A crescent moon, stars, and clouds surround the precious sleeping infant. The rings of grayish-silver hues on the bottom half are repeated on the upper tier by the gray umbrella-toting elephant cake topper. Well-thought-out color choices include the yellow fondant on the upper tier repeated by the yellow umbrella which is tied with a silver ribbon. 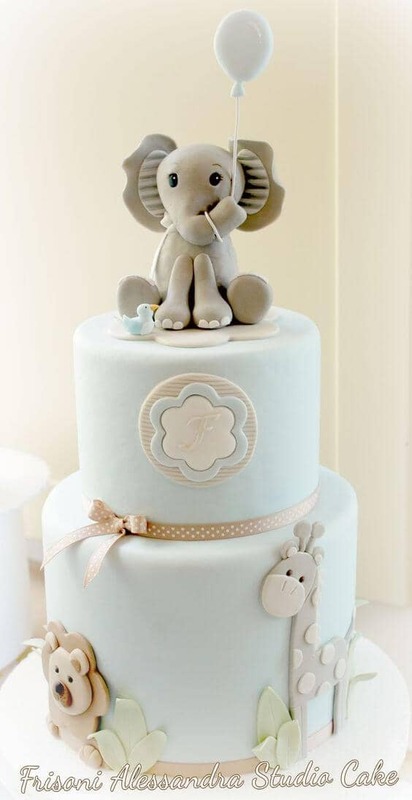 This is a very sophisticated elephant baby shower cake design. This classically shaped 2-tiered design is a study in contrasts. 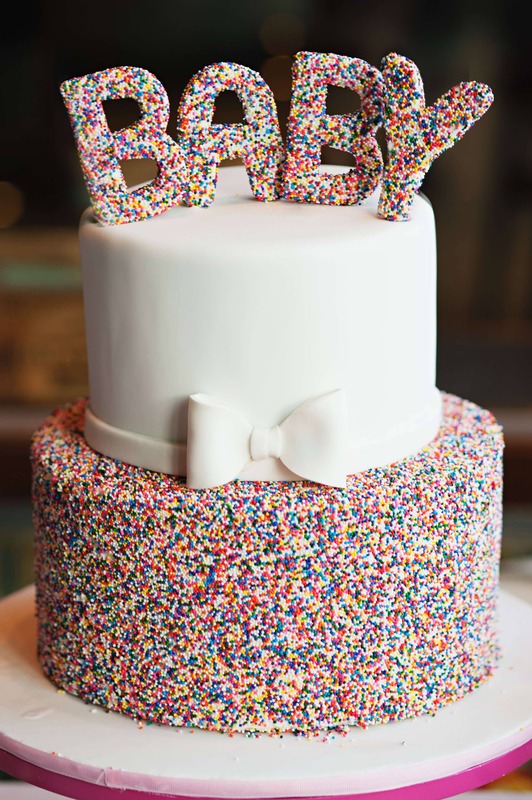 The stark white upper tier with a simple white bow is in contrast to the dense texture of nonpareils on the bottom tier. The word “BABY” that tops the white one is also covered with nonpareils. 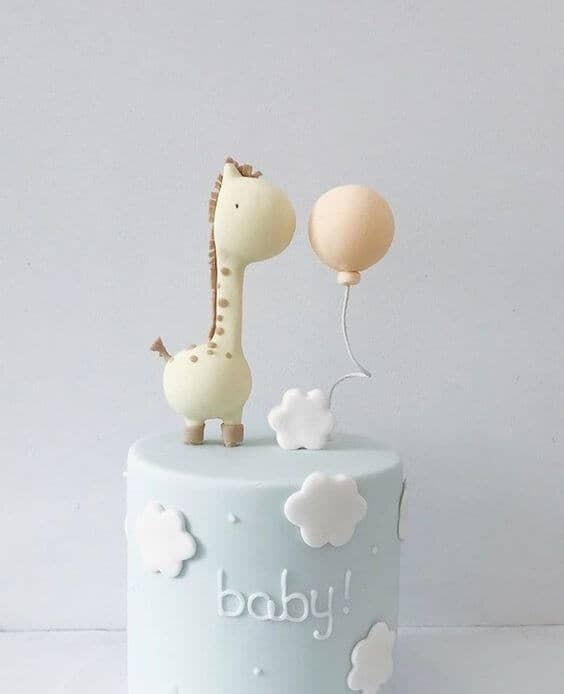 This is a very unique baby shower cake and is very striking. This is one of the baby shower cakes that’s so realistic! It’s a popular trend and very skillfully done here. 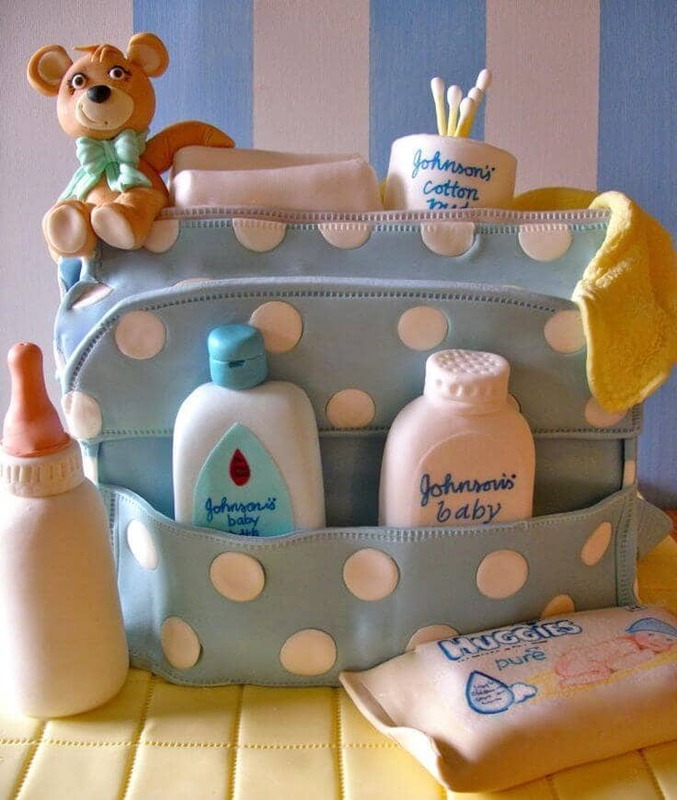 Everything for an outing with baby is included in magnificent detail in and around the diaper bag in this unique cake design. This illustrates cake-decorating as an art! Mom and all the guests will be amazed. The baby’s little clothes and teddy bear are pinned with clothespins on the line in front of a sky blue background. 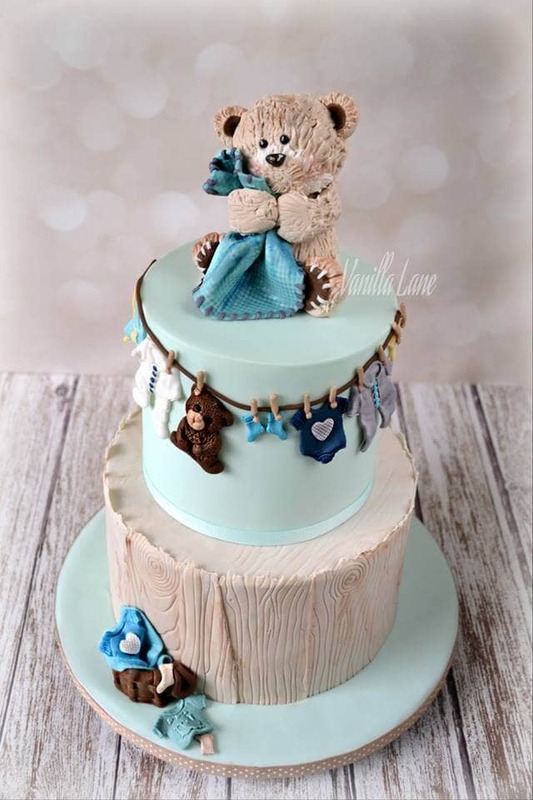 The bottom tier is a tree stump and there’s a plush teddy bear hugging his blankie atop this unique cake idea. Some of the little clothes have tumbled down, naturally. This one is awesome, old school, and clearly delicious. It’s simple yet adorable. 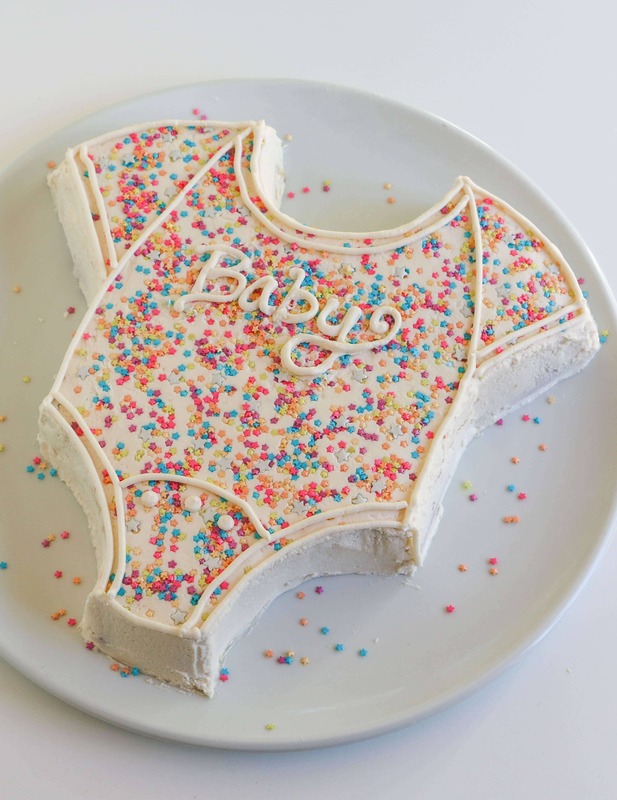 Frosted with delicious buttercream, shaped like a onesie and covered with star-shaped, multi-colored sprinkles. The seam details and the word “Baby” are piped on it in classic fashion on this baby shower sheet cake. Two of the babies on this cake are wailing with eyes scrunched closed. The third baby has stopped crying but looks a little confused, pouting with eyes wide open. These three infants look like 3D animation. The black polka dots on edge of the cake plate and black inside their deep wide open mouths are a contrast to their pink and rosy-cheeked little bodies. Very well-done and super funny! 21) Is this Teddy Bear Named Buttons? It should be. 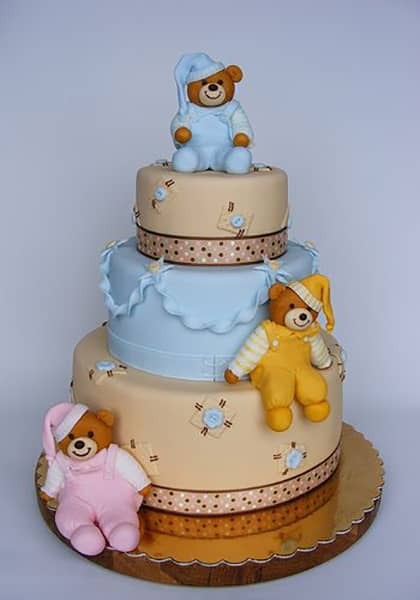 A blue teddy bear tops this cute 2-tiered, 2-colored baby shower cake. 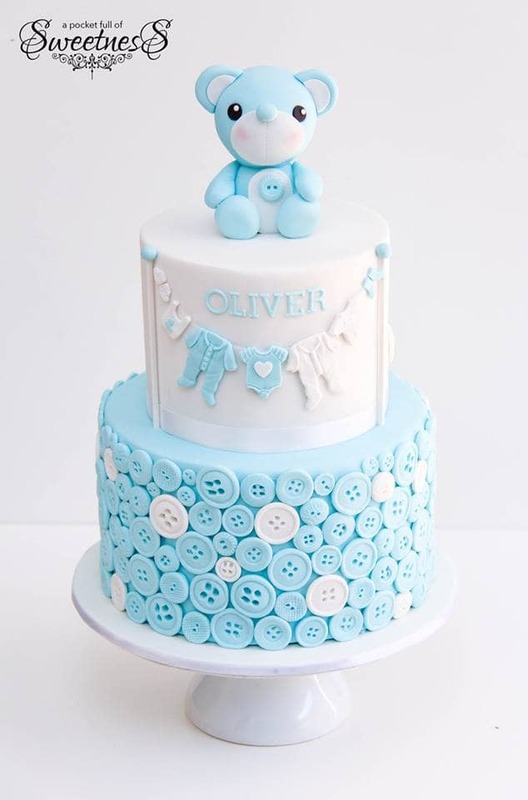 The bottom tier is adorned with buttons covering the sides while the upper tier features baby clothes hanging from a clothesline. And there’s the most perfect spot for baby’s name! This is another very well-designed cake you can’t stop staring at. 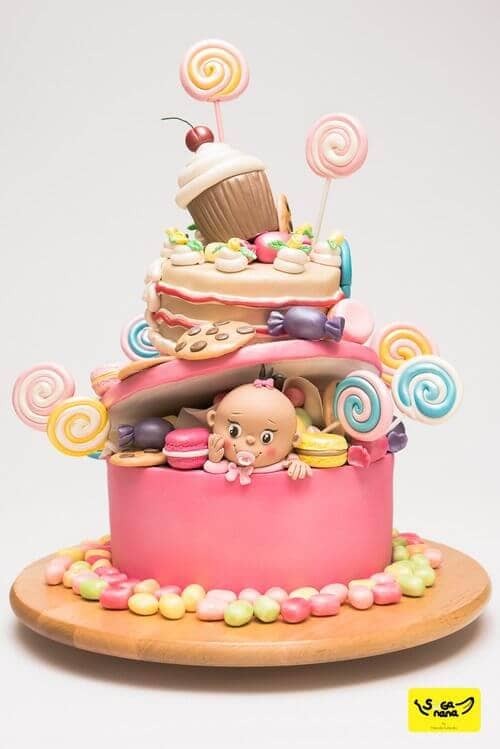 Lollipops, cookies, candies and baby, all as sweet as can be, are exploding out of this super colorful cake in all directions. The tilted cupcake topper is the perfect addition. Again, this topsy turvy cake looks like the 3D animation! It’s one of the most unique and fun cake designs. This 3-tiered airy design has a unique look to it. The flattened images will accommodate easier serving and the “air” theme is carried out well with the images. A little balloon toting, smiling boy sits atop it. There’s a nice place for baby’s name as well. This cake is so happy and such a breath of fresh air! 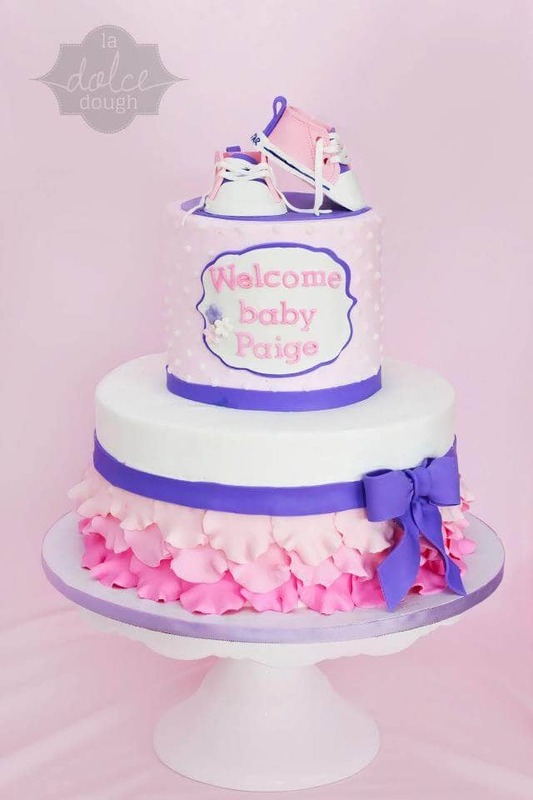 This simple and sleek modern design is very eye-catching and one of the best cakes for girls without being too pink. 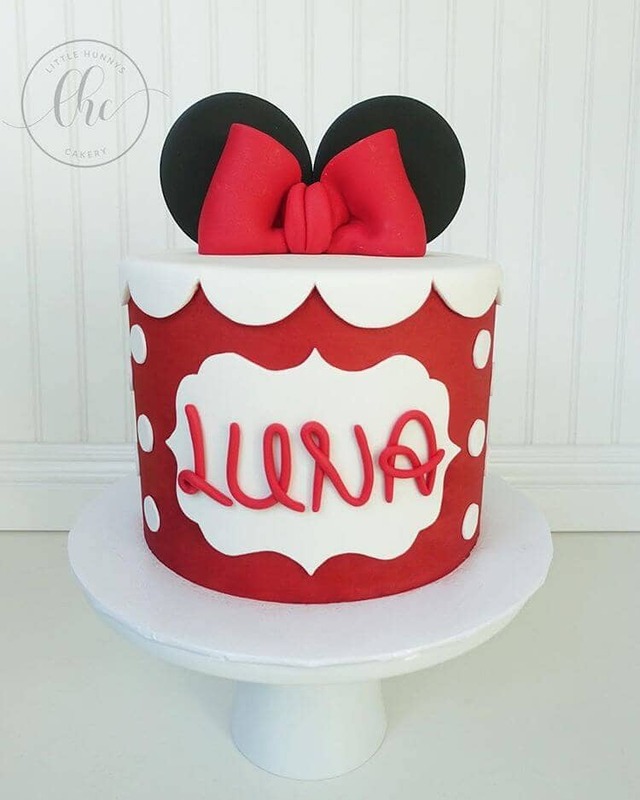 If someone is a Disney fan (and there are many) this unique baby shower cake is perfect for a baby shower given for parents who are expecting a little girl. 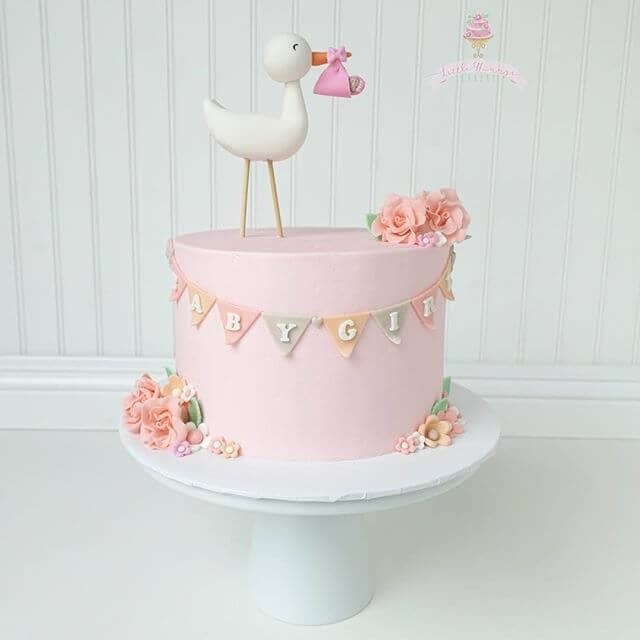 This unique cake design will be a perfect addition to the table at your baby shower! 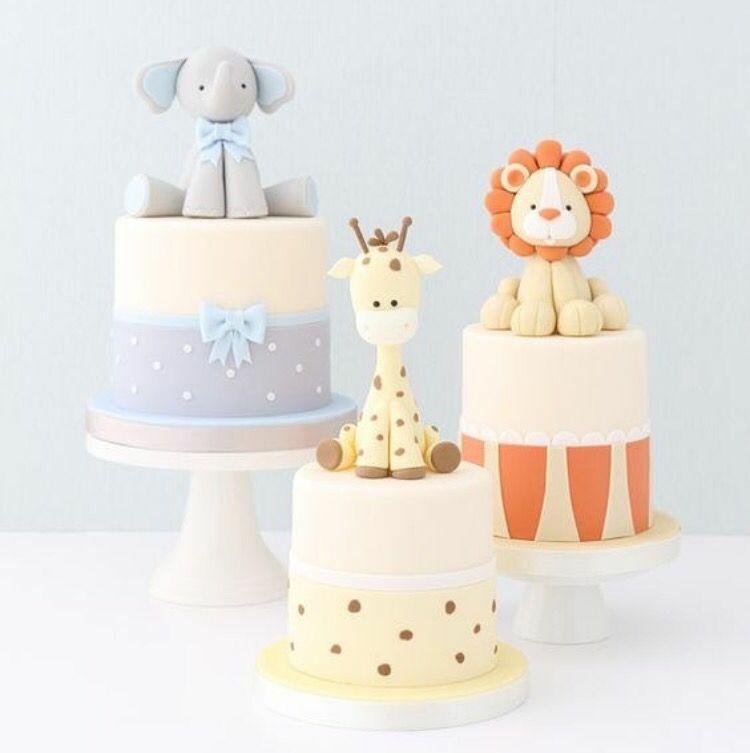 An elephant, a giraffe, and a lion are toppers on three separate multi-layered creations. Displayed at different heights and of different color schemes they work together nicely and certainly make a statement. 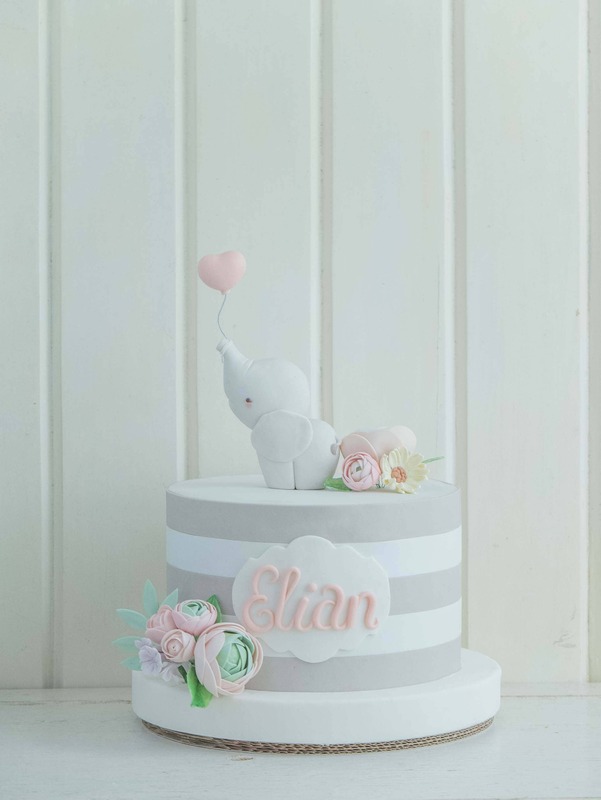 Classic pastels are the palette for the familiar images on this baby shower cake. Baby shoes take center stage as a topper with hearts floating above them. There are also multi-colored hearts scattered about lavishly. Clean fresh white fondant is the background for this creation. These four active bears are arranged on classic pastel baby colors. Each of the three tiers is covered with a different colored fondant. Daisies, gingham, and clouds in the sky adorn this cake design. The middle tier has space for a message. Themes, patterns, and colors planned well to work perfectly together. 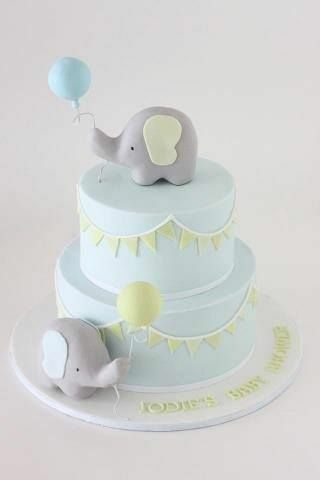 Here’s another elephant baby shower cake. Two elephants, one with a pale blue balloon and the other with a pale yellow one appear to be marching around to celebrate baby’s arrival. The background of the two tiers is a soft blue and adorned with yellow banners. The colors are very soft and the elephants stand out against the background colors. This cake is beautiful. Every color of the rainbow is in it. The topper is a pink mama bird next to her baby in a nest. The giant green bow seems to be tied where the cake meets the plate. “baby GIRL” is written on the front with colorful flowers and a cute little ladybug. Non-stop color! Sky blue fondant covers the cake with a big pink bow around the bottom. Written on top is the Twinkle Twinkle Little Star lyric with the variation of “…wonder what you are…” among stars, a moon, and a cloud. That’s what makes the pink and blue so appropriate, not knowing baby’s gender. Very cute. 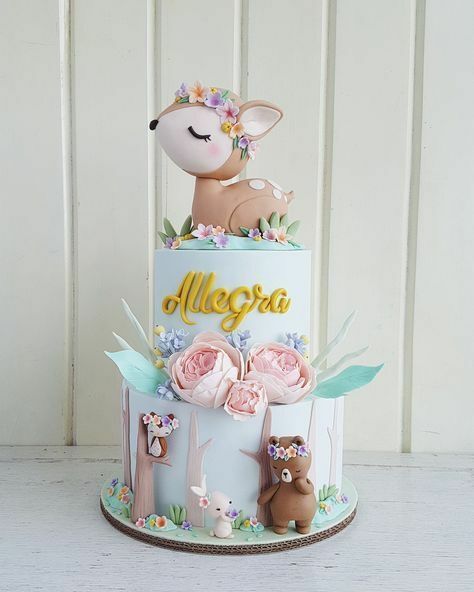 This is another one of the woodland-themed baby shower cakes that are currently so popular. Besides the fawn topper, there are other baby animals around the bottom tier and they all have flowers on their little heads. There’s a perfect spot for the baby’s name right under the lovely fawn topper. 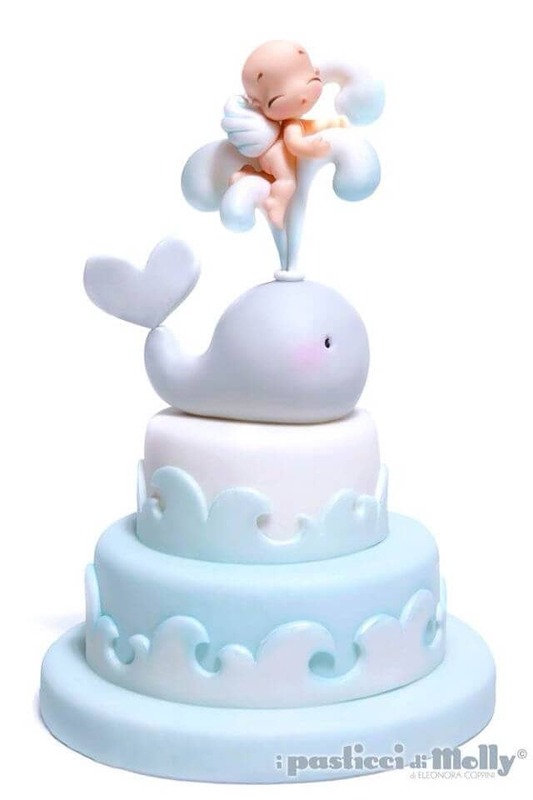 A little whale spouting water in which a baby with angelic wings plays is the baby shower cake topper on this one. The tiers are encircled with cool wave borders. The cake has a fluorescent look to it and the little whale has soft rosy cheeks, all done with skillful airbrushing. The pink baby really stands out against the cool watercolors. Here’s a 3-tiered cake that features three little animals who are hanging a banner that reads “BABY.” The bottom layer is covered with big pink roses, the middle layer is a contrasting gray and white zig zag pattern and the upper layer where the animals are playing is solid pink. 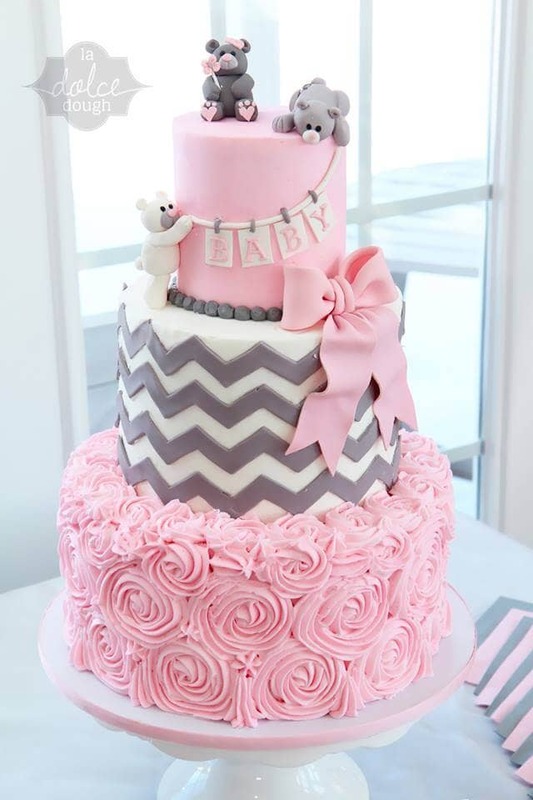 This baby shower cake for girls also has a big pink bow. This is one of the clean-edged baby shower cakes that is very modern and sleek. This one is just one tall tier and has a giraffe topper next to a pink balloon. 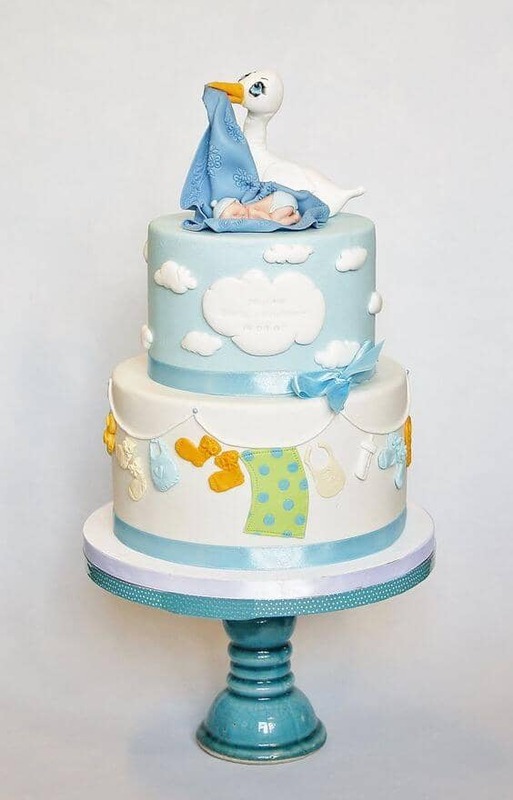 The sides are scattered with stylized clouds and the word “baby!” is prominently piped on among the clouds. It’s one of the baby shower cakes that could be gender neutral. Pale pink and blue dominate this cake. 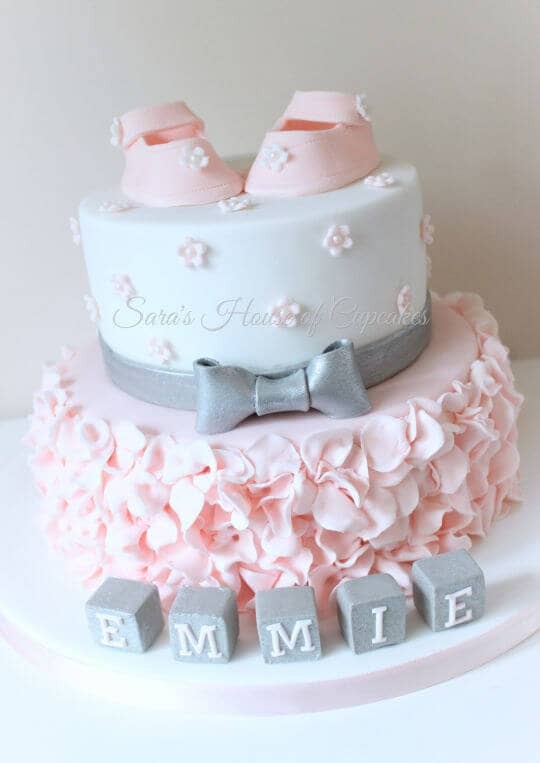 It’s topped with pink baby girl shoes and the bottom tier of this 2-tiered cake is all pink ruffles. Blocks with letters spell out baby’s name and there’s a silver ribbon and bow encircling the middle. This one is definitely a baby shower cake for girls! This cream-colored, smooth-edged baby shower cake has decorative flowers growing up from greenery as a border on the bottom edge. Its topper is a mom in a straw hat pushing a pink baby buggy which holds a smiling baby. This cake is very springlike and so different than most of the others. 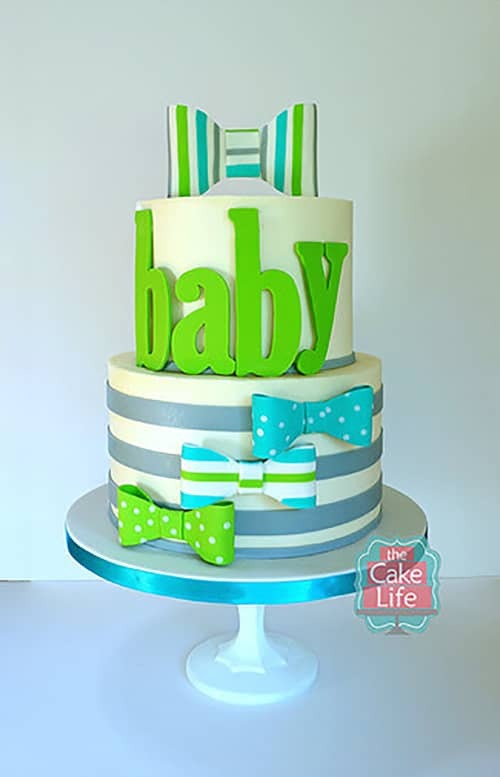 Vivid turquoise with brown accents dominates this baby boy cake. The colorful giraffe topper has a very satisfied expression, as though he wanted it to be a boy. Turquoise and white animal prints cover each of the two layers, one round, one square. It’s a very unique cake design. Soft pink and vivid green colors are blended to create the abstract topper with a contrasting background of green. The green drips down over the sides which makes another pretty contrast to the pale pink. It’s gorgeous! Guests will be tempted to stick their fingers in that piped topper! 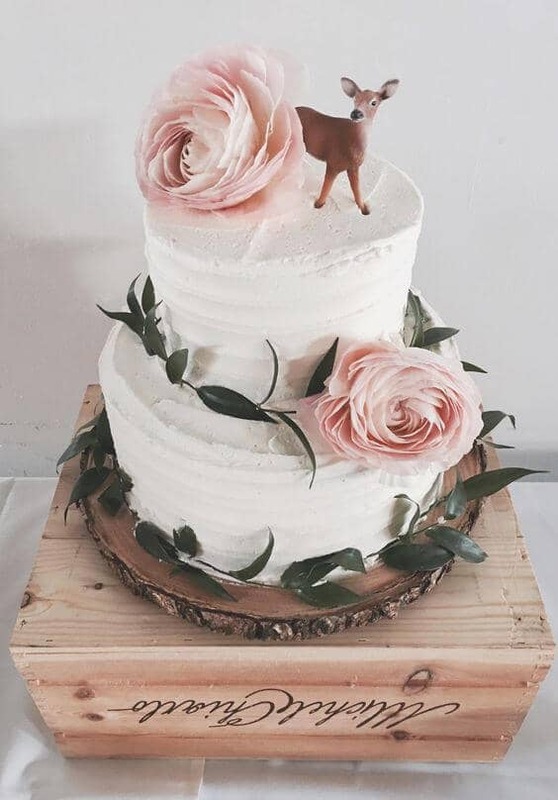 This is a very modern and unique cake design. This one shouts baby. Smooth blue sides on this one tall tier baby shower cake. 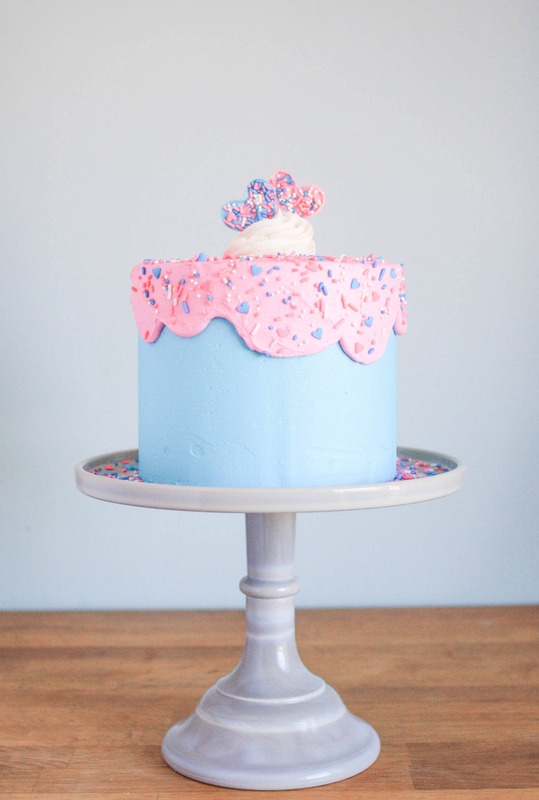 It’s topped with pink flowing over the edges and is generously sprinkled with assorted shapes of pink, blue and white that land on the cake plate at the bottom. Two sprinkled hearts in a big soft white piped curl are at the top. This one’s red, white and blue! 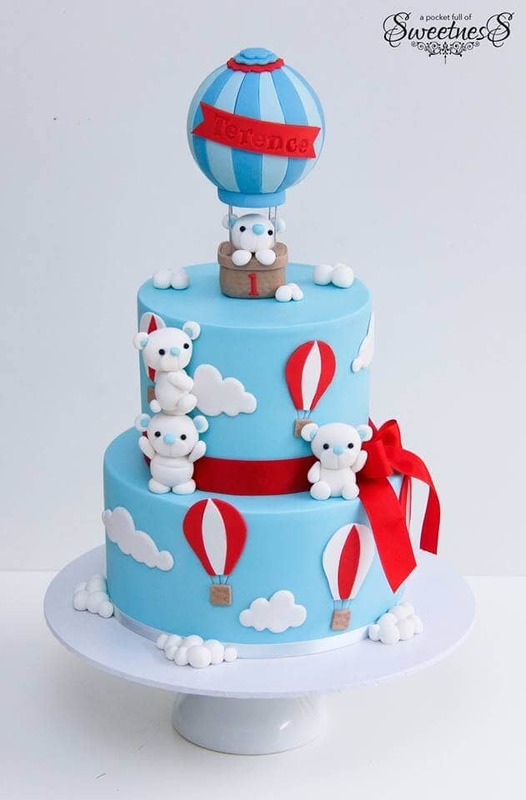 Topped with a hot air balloon containing one of the bears and adorned lavishly with white clouds, the middle is tied with a bright red ribbon. The bears are all looking out and waving at you. There’s a red banner on the balloon to show baby’s name. The details on this baby shower cake appear to be sewn. Stitching, buttons, and ribbon are part of the design. One bear wears pink, one tan and the upper one is in blue, all with caps on their heads. The mixed patterns are nice and the cake is shown on a shiny coppery plate. Here’s another one of the baby shower cakes with a sleek modern design. 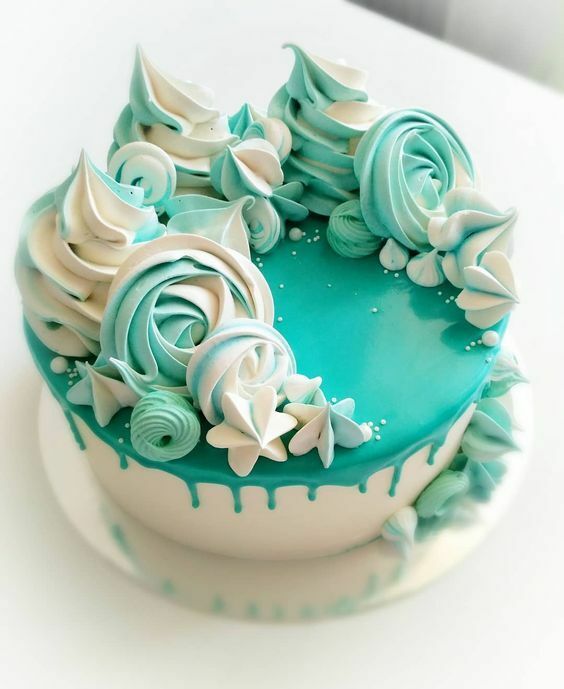 The 1-tier cake has only blue fondant with white clouds. 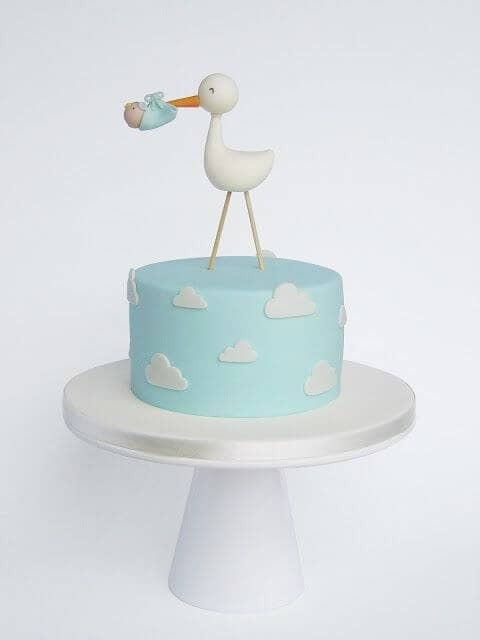 The topper is also very clean and simple, a classic plain white stork carrying a brand new baby in a blue blanket with its beak. Very cool. This cake has two tiers. The top one has a blue background with clouds and the other has a white background adorned with a clothesline. There’s a blue ribbon tied around the bottom of each tier and the stork on the upper tier is unrolling a sleeping baby from its blanket. Adorable. This is another one of the cakes for girls! It has two tiers. The bottom one is covered with shades of pink ruffles and a purple ribbon and bow. The top tier is pink with white dots. That one also has a purple ribbon at the bottom. A really sweet and girly addition are the pink baby sneakers placed on the upper tier. The upper tier also has a space for a message. Three little farm animals are posed on this pink and white very girly cake. There are pearls, pink dresses, ruffles, ribbons, bows and a perfect place for the baby girl’s name to be spelled out. There’s also a toy block on the upper tier showing baby’s first initial. 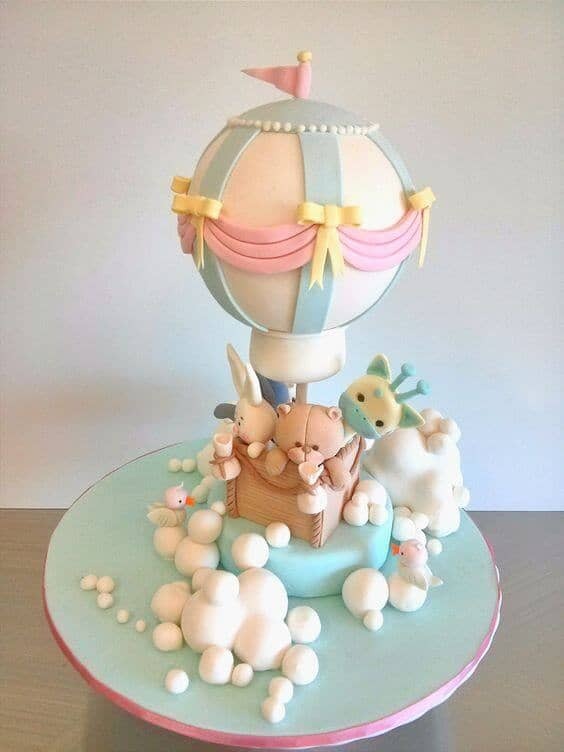 This is a 2-tiered white fondant-covered baby shower cake. 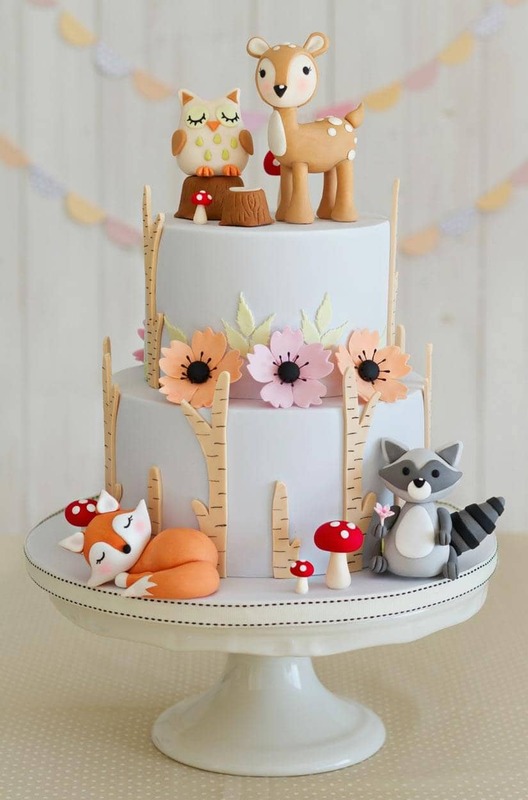 A fawn and an owl make up the baby shower cake topper with a fox and a raccoon nearby. There are also tree trunks, flowers, and mushrooms which add to the gentle look of this baby shower cake idea. The animals on this one are so sweet and gentle-looking. Wow! This is one of the really tall baby shower cakes! It will make a real statement on your table. It’s loaded with interesting texture too. 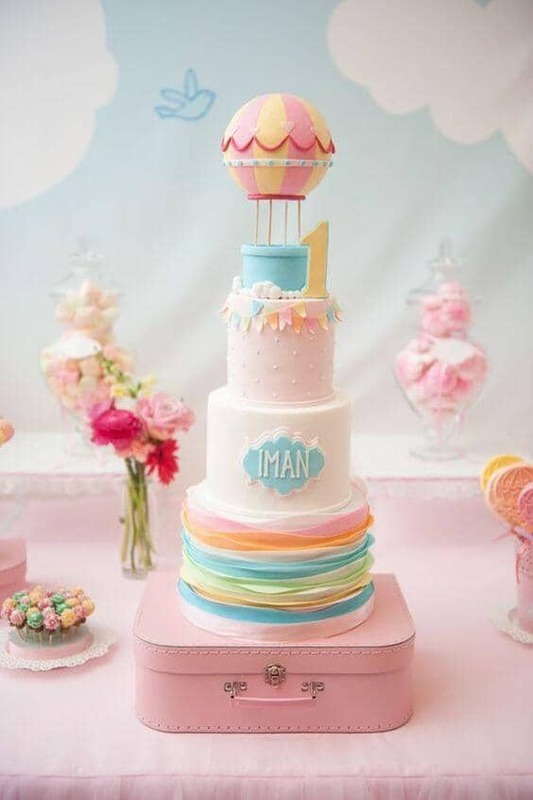 Soft cloth-like multi-colored pastel rings encircle the bottom, white dots on the upper layer, a plaque for baby’s name near the bottom and the balloon topper has many colors and textures too. Awesome! This 3-tiered baby shower cake idea is impressive. 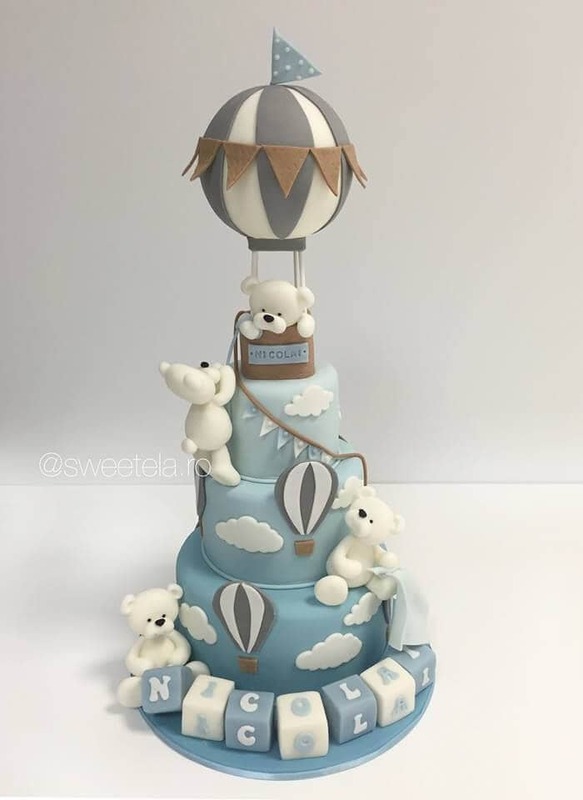 All the tiers are covered with a grayish-blue fondant and four busy bears are placed around in different animated positions with clouds. 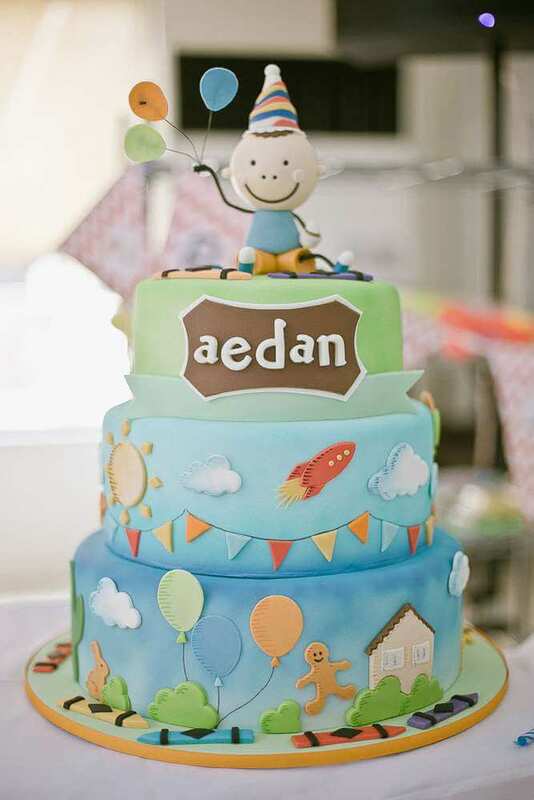 Blocks at the bottom spell out baby’s name and the balloon topper is quite large and has brown and gray accents. This one is very colorful yet has clean lines. The classic toys that adorn it are its topper. 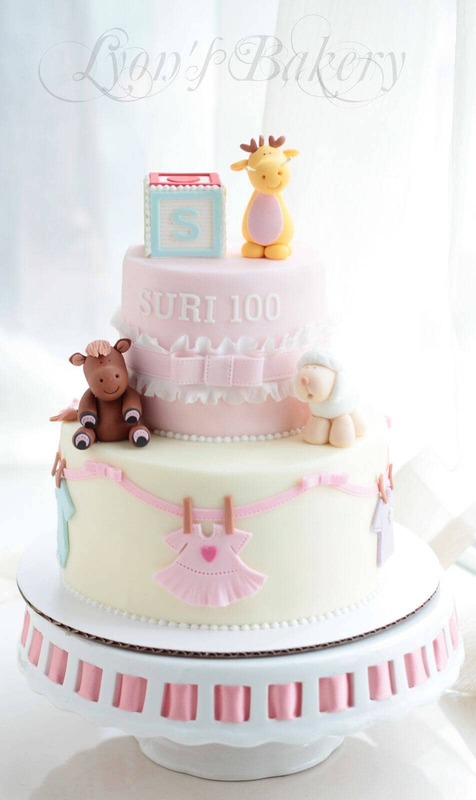 The baby’s initials are shown on the side in standout white icing. 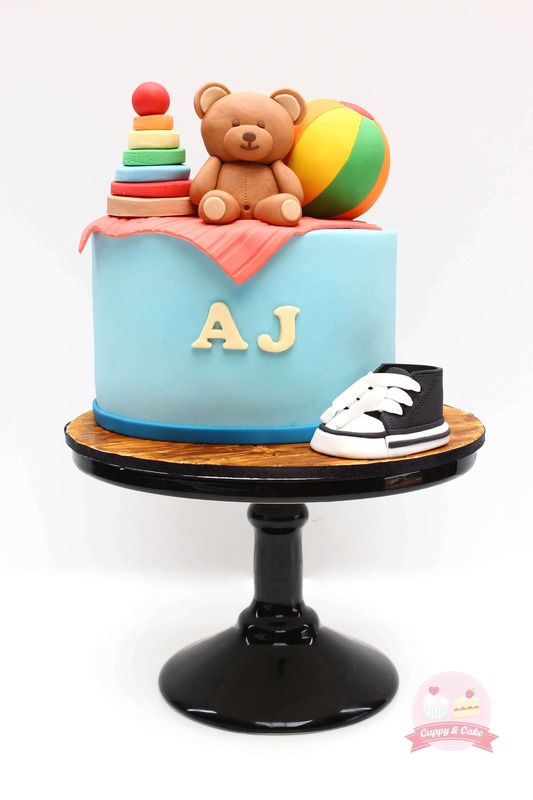 It’s covered with blue fondant and has a cute black sneaker sitting next to the cake at the bottom which is wisely repeated with the black color of the cake pedestal. 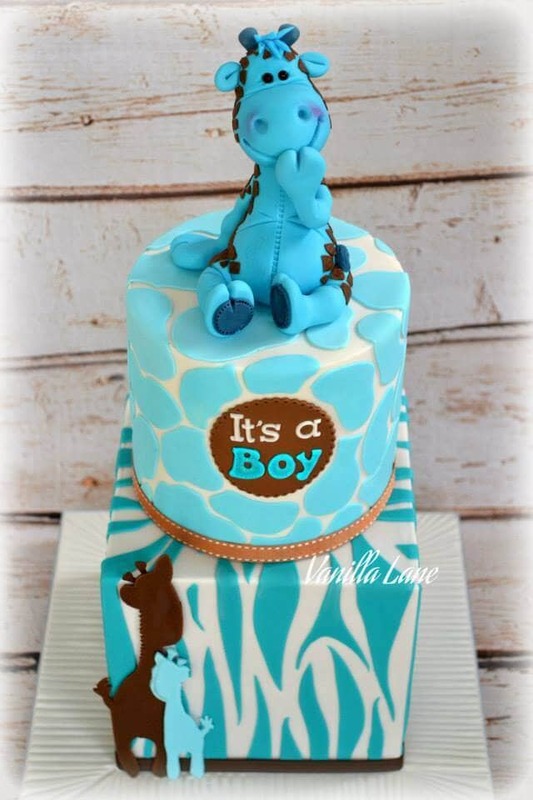 This is a good choice for a baby shower cake for boys! Several little animals are involved in getting the balloon ready for takeoff. Soft white puffs surround them. The balloon itself is amazing! It’s so well-designed with blue stripes on white, a ring of pearls encircling a pink flag atop the balloon. A pink banner draping around the balloon is held in place with pretty yellow bows. The wicker basket already has a couple of passengers. Gorgeous. 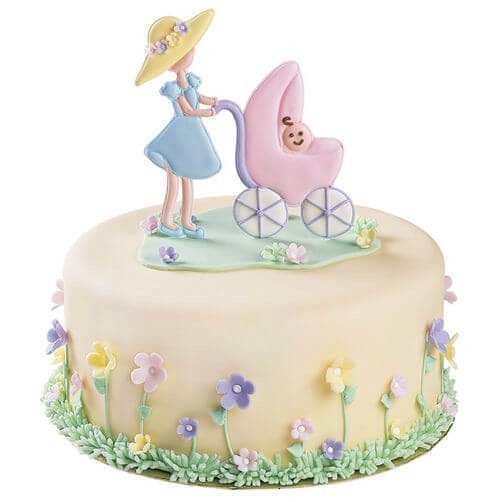 Are there some cake ideas here that match your baby shower idea? These cakes are so great that one of them may give you an idea! It could work either way. The main point is that the cake will be an important element at the baby shower. 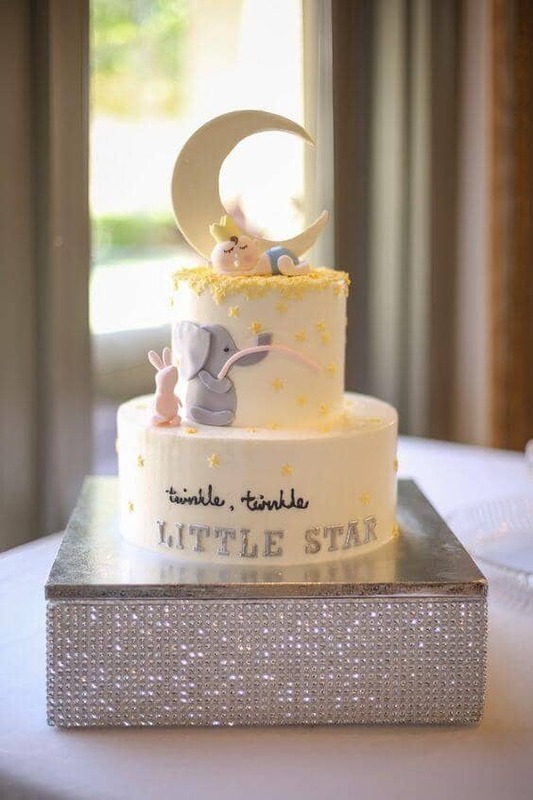 Hopefully, one of these baby shower cake pictures will inspire and guide you in your planning. Most important is that you have fun planning this event, and get lots of help, both professionally and from friends and family. The day will be enjoyable and make lots of great memories for everyone!